Raise your hand if you are from a water tower town? You know, the towns where the tallest structure smack in the middle of town can be seen for miles around is the water tower. Hopefully it doesn't boast Billy Bob loves Charlene in the color John Deere Green, or show signs of any other graffiti. And if it does, that just adds flavor and originality, right? I am from one of those water tower towns. We have the one above, which has been there forever, and two skinny blue ones which are near my parents home. This particular tower holds a few memories. One memory I was recently reminded of on the Facebook page "You know you're from Wilson, OK if..."
One of my classmates brother climbed that old water tower, I believe he had a BB gun with him. He was only a few years older than myself. I think the entire town went down to watch, scared that he would jump. He didn't and now has a wife and kids. Season 10 American Idol winner, Scotty McCreery sings the following song about a water tower town. I think it stands true, at least for my hometown. 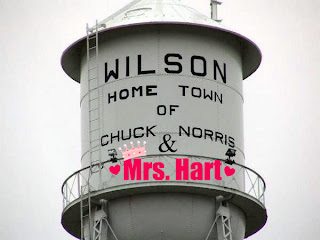 Oh, and should I petition the mayor and city council of Wilson to put my name on the tower also? I'm thinking the crown and pink are a nice added touch. The fireflies come out when the sun goes down. In a water tower town. And the girls come out when the sun goes down. Peace and quiet make such a beautiful sound. Yeah, in a water tower town.